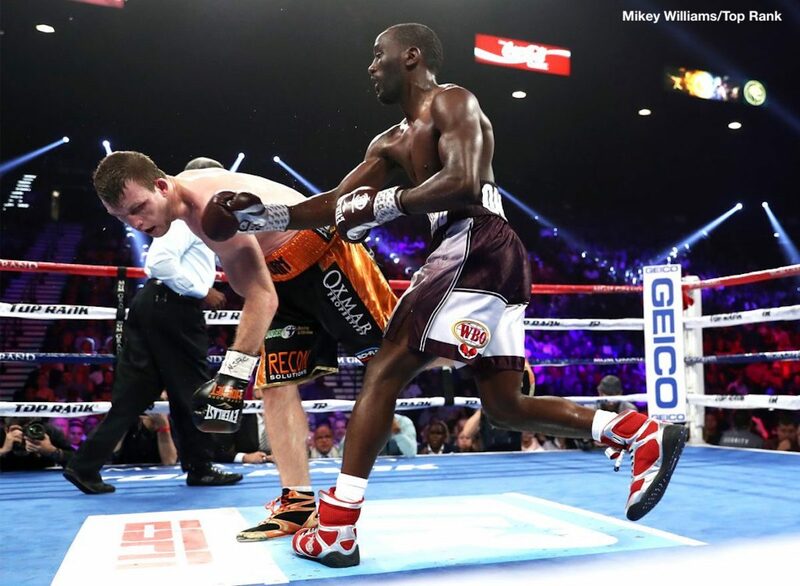 Terence Crawford made his first fight at 147 on Saturday night in stopping WBO welterweight champion Jeff Horn in the 9th round in a premature stoppage at the MGM Grand in Las Vegas, Nevada. Crawford (33-0, 24 KOs) did what he had to do to beat a human punching bag in previously unbeaten 30-year-old Horn (18-1-1, 12 KOs), whose head-ramming tactics weren’t on display nearly as much tonight as they were last July against Manny Pacquiao. The victory for Crawford won his third division world title. Crawford came into the fight having captured world tiles in two divisions. He showed that he has the size and the punching power to compete against the 170lb Horn, who looked to be the heavier of the two fighters. Crawford dominated Horn from start to finish in this Top Rank promoted in house fight. The boxing fans knew coming into this fight that Horn was going to lose, but they just didn’t realize how badly it was going to be. Fighting in front of 8,112 boxing fans in this ESPN+ televised fight, Crawford put on a boxing clinic tonight. He changed stances to try and outsmart Horn, and probably didn’t need to because it was such a rout from the start. After the fight, Crawford said he wants to fight the other world champions at 147. He looked at his promoter Bob Arum and let him know that’s what he wants. Whether Arum is going to try and get the other champs at 147 to fight Crawford is unclear. WBA ‘regular’ champion Lucas Matthysse likely won’t fight Crawford, and Manny Pacquiao reportedly has no interest in fighting him. I’m not sure that Arum is too eager at letting Crawford fight IBF welterweight champion, because he’s no Jeff Horn or Julius Indongo. Crawford would have a very real chance of losing to Spence and losing badly by a knockout. All that hard work Arum has put into trying to build Crawford’s brand would go down the tubes of Spence knocks him out viciously and exposes him. Besides that, it’s unclear whether the fight can get made. Crawford still doesn’t have a large fan base and he fights on ESPN. Spence is arguably the more popular fighter and he fights on Showtime. It’s highly doubtful Spence is going to fight Crawford on ESPN. So, there it is. Spence vs. Crawford is a fight that probably won’t get made due to a number of reasons. Horn never had a reputation for being strong. It’s unclear what Crawford is talking about. Horn’s reputation is that of a crude brawler, who was gifted a 12 round decision win over Manny Pacquiao last July in the eyes of a lot of boxing fans. Horn roughed Pacquiao up last year and won a fight that many boxing fans felt he should have lost. That’s the reputation that Horn had. That’s the reason why there wasn’t much interest in the Horn vs. Crawford fight, because Jeff was viewed as a paper champion by a lot of people. For Crawford to get a lot of respect from the boxing public, he’s got to beat fighters like Spence and Keith Thurman. Defeating the likes of Jeff Horn, one of his Top Rank stablemates, isn’t going to do it. Crawford landed 155 of 367 punches for a connect percentage of 42 percent, according to CompuBox. For his part, Horn connected on 58 of 257 punches for a connect percentage of 23. As you can see, the punch stats were in Crawford’s favor by a large margin.